Madam Secretary is a patchwork of genres. It’s cobbled together coherently, but not quite seamlessly: The spy-thriller elements don’t quite fit with the breezy walk-and-talk flair of The West Wing. And those sequences don’t quite fit with Madam Secretary’s focus on well-placed women in the corporate and political world, which echoes the show that’s following it on the CBS schedule: The Good Wife. 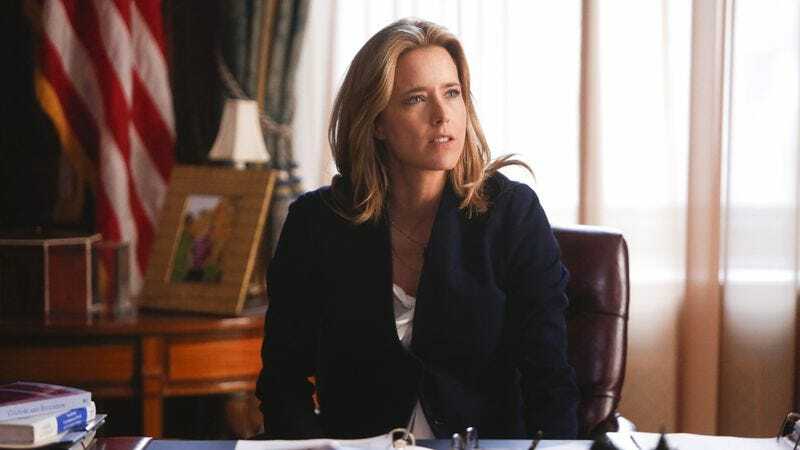 On the idealism front: In the show’s pilot, newly appointed Secretary Of State Elizabeth McCord (Téa Leoni) spends a long evening entertaining the polygamist ruler of Swaziland. She smooths over the awkwardness of inviting the king and his numerous wives to a formal dinner, deftly turning the conversation to an embrace of the feminine perspective on HIV prevention in the visitors’ homeland. It’s a softball of a victory—politesse, the greater good, gender equality, and elegant glassware—entirely devoid of the hard work of hammering out details. It’s not that all of Madam Secretary feels bloodless, but based on the strength of the pilot, it’s the prettier side of politics that’s easier for the show to sell: the stately neoclassical architecture of Washington, D.C., the elegant events, the fancy gowns, the lengthy titles of foreign emissaries from far-off lands. And what’s not readily available in the fast-paced world of diplomacy is easily supplied by the mushy strings scoring a rescue operation of two American teenagers captured in the Middle East, followed by a slow-motion action shot of their parents rushing up to embrace them before both boys drop to the tarmac and kiss the ground. It’s all so wholesome, it might as well be packaged by Quaker Oats; that’s grounded by the way Leoni’s directed to play her character: competent, practical, and a bit folksy. She mucks stables and answers questions bluntly and looks people square in the face with an American, do-it-herself attitude that would speak to even the most disaffected Iowan swing voter. Network television, like politics, wants to play to the broadest demographic possible, so the casting makes sense. But it’s not all that interesting to watch a person without any obvious flaws (besides being “too good” at her job) navigate D.C. politics. Where Madam Secretary starts to come together is in its protagonist’s gender, because the show would have no hook if it were Mister Secretary. From the start, the audience roots for Elizabeth: Partly that’s because she’s been abruptly launched into the job in the middle of the term; partly that’s because a she’s a beautiful woman in what is still, regrettably, a man’s world. Through that lens, Leoni’s character begins to acquire more depth: Her competence and folksiness, if that’s what it is, is hard-earned and harder still to deploy. Leoni has a bit of trouble fully inhabiting the role in this first episode—but some of that may be that the character is written to be a little restrained. There are times of dry humor in which Elizabeth is surprisingly warm, and then other moments, technically “tense,” where nothing comes through at all. But it’s a pilot, and a new role; this type of thing can be improved upon. 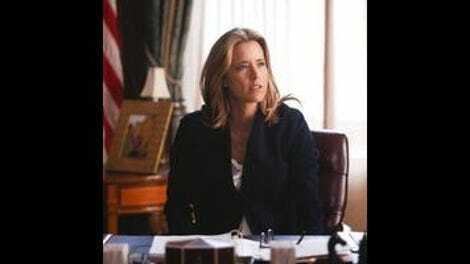 Madam Secretary is not perfect, but it could be. There are seeds of something excellent in this pilot, one that’s able to tell a character-driven story in a world that’s constantly changing. It’s unlikely that Madam Secretary will ever get quite as wonky as The West Wing or as nitty-gritty about intelligence as Homeland. But the pilot demonstrates interest in making the smart and successful woman at its core into a real character, instead of an easy set of character shortcuts that exist for some other purpose. That’s the type of platform that could send you straight to the White House.